She was a 6,987 GRT motor tanker that was sunk on 18 January 1941 by a gunfire from German auxiliary cruiser Kormoran at position 26° 29' N 31° 07' W. An account which can be found at External Ref. #28 describes the sinking and notes that the raider took many survivors aboard including the ship's Master. These were incarcerated as POWs and presumably Mr. Leaman died whilst a POW. Alexander	 Auld	 56	 18/01/1941	 Greaser	 Merchant Navy	 United Kingdom	 Tower Hill Memorial	 Panel 21. Age 56. Son of John and Isabella Auld. Stanley	 Barker	 43	 18/01/1941	 Greaser	 Merchant Navy	 United Kingdom	 Tower Hill Memorial	 Panel 21. Age 43. Son of Roland and Mary Barker; husband of Hilda Barker of Monkseaton Northumberland. George Frederick	 Gates	 46	 18/01/1941	 Able Seaman	 Merchant Navy	 United Kingdom	 Tower Hill Memorial	 Panel 21. Age 46. Husband of Helena Gates of Liverpool. 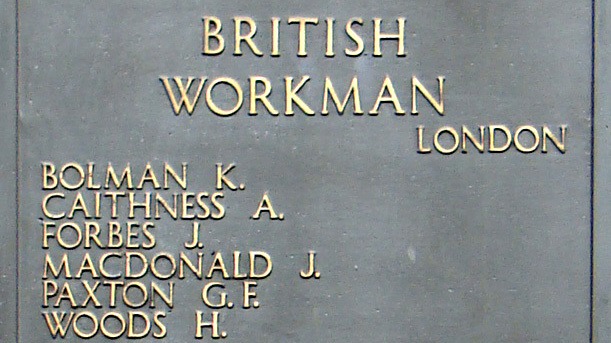 Hogarth George	 Mack	 26	 18/01/1941	 Second Officer	 Merchant Navy	 United Kingdom	 Tower Hill Memorial	 Panel 21. Age 26. Son of Mr. and Mrs. J. W. Mack of Duxford. Cambridgeshire. Thomas	 Morris	 27	 18/01/1941	 Engineer Officer	 Merchant Navy	 United Kingdom	 Tower Hill Memorial	 Panel 21. Age 27. Son of Thomas and Margaret Ireland Morris of St. Monance Fife. John Anderson	 Porter	 34	 18/01/1941	 Chief Officer	 Merchant Navy	 United Kingdom	 Tower Hill Memorial	 Panel 21. Age 34. Son of John and Mary Ann Porter; husband of G. M. Porter of North Shields Northumberland. Joseph Daniel	 Scannell	 36	 18/01/1941	 Greaser	 Merchant Navy	 United Kingdom	 Tower Hill Memorial	 Panel 21. Age 36. Son of Mr. and Mrs. Edward George Scannell. She was a 4,696 GRT steam tanker that was sunk on 24 June 1943 by a torpedo fired by Japanese submarine I-27 at position 25° 13' N 58° 02' E.
Ah Tong	 43	 24/06/1943	 Carpenter	 Merchant Navy	 China, (including Hong Kong)	 Hong Kong Memorial	 Age 43. Husband of Chang Ngishe of Chong Yark. Kwangtung China. Darley Campbell. Barton	 45	 24/06/1943	 Master	 Merchant Navy	 United Kingdom	 Tower Hill Memorial	 Panel 21. Age 45. Son of Frank Townend Barton M.R.C.V.S. and of Williamina McKay Barton (nee Matheson); husband of Olive Mary Barton of Gorey Jersey Channel Islands. James Henry	 Bradshaw	 21	 24/06/1943	 Second Radio Officer	 Merchant Navy	 United Kingdom	 Tower Hill Memorial	 Panel 21. Age 21. Son of Henry and Florence Bradshaw of Alkrington Lancashire. James Mcmurtry	 Corbett	 22	 24/06/1943	 Third Radio Officer	 Merchant Navy	 United Kingdom	 Tower Hill Memorial	 Panel 21. Age 22. Son of Thomas H. and Margaret A. Corbett. Robert	 Coulson	 37	 24/06/1943	 Chief Engineer Officer	 Merchant Navy	 United Kingdom	 Tower Hill Memorial	 Panel 21. Age 37. Son of Edward and Mary Ann Coulson; husband of Rena Coulson of Amble Northumberland. Eric	 Dawes	 20	 24/06/1943	 Third Officer	 Merchant Navy	 United Kingdom	 Tower Hill Memorial	 Panel 21. Age 20. Son of Ernest and Annie Hilda Dawes of Westgate in Weardale Co. Durham. Graham Edward	 Long	 30	 24/06/1943	 Second Officer	 Merchant Navy	 United Kingdom	 Tower Hill Memorial	 Panel 21. Age 30. Son of Harold George and Mary Long; husband of Suzanne Irene Long of Westbury-on-Trym Bristol. 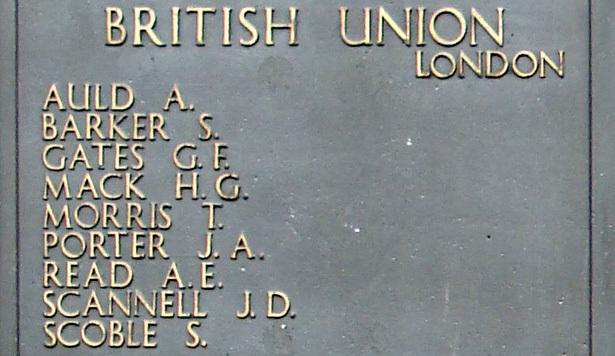 Gordon Belt	 Peirson	 23	 24/06/1943	 First Radio Officer	 Merchant Navy	 United Kingdom	 Tower Hill Memorial	 Panel 21. Age 23. Son of John Henry and Mary Margaret Peirson. She was a new 8,093 GRT motor tanker that was hit on 3 January 1943 by a torpedo fired by German submarine U-514 at position 20° 58' N 44° 40' W. The abandoned and burning ship drifted for three weeks and was sunk by two torpedoes fired by U-105 on 24 January 1943. 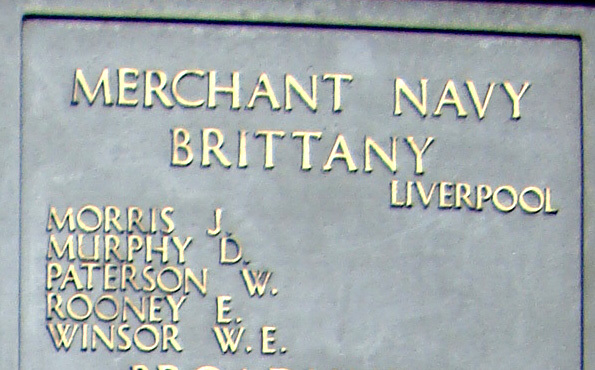 Francis	 Butler	 20	 03/01/1943	 Ordinary Seaman	 Merchant Navy	 United Kingdom	 Tower Hill Memorial	 Panel 21. Age 20. Son of John Butler and of Mary A. Butler of Wigan Lancashire. John Cranstoun	 Butterwick	 37	 03/01/1943	 Chief Officer	 Merchant Navy	 United Kingdom	 Tower Hill Memorial	 Panel 21. Age 37. Son of John and Dora Butterwick; husband of Marjorie Butterwick of Darlington Co. Durham. Denzil Theodore	 Cameron	 23	 03/01/1943	 Fourth Engineer Officer	 Merchant Navy	 United Kingdom	 Tower Hill Memorial	 Panel 21. Age 23. Son of Lochiel George Cameron and of Ione Lydia Ivy Cameron of Ipswich Suffolk. Francis George	 Child	 24	 03/01/1943	 Ordinary Seaman	 Merchant Navy	 United Kingdom	 Tower Hill Memorial	 Panel 21. Age 24. Son of William John Child and of Elizabeth Jane Child of Penygroes Carmarthenshire. George Ivan	 Houghton	 17	 03/01/1943	 Cabin Boy	 Merchant Navy	 United Kingdom	 Tower Hill Memorial	 Panel 21. Age 17. Son of John and Louisa Ellen Houghton of Warrington Lancashire. Rowland	 Marshall	 53	 03/01/1943	 Chief Engineer Officer	 Merchant Navy	 United Kingdom	 Tower Hill Memorial	 Panel 21. Age 53. Husband of Martha B. Marshall of South Shields Co. Durham. George William	 Milligan	 49	 03/01/1943	 Second Engineer Officer	 Merchant Navy	 United Kingdom	 Tower Hill Memorial	 Panel 21. Age 49. Son of William and Sarah Milligan; husband of Mary Phillips Milligan of Brighton Sussex. John	 Mcclean	 48	 03/01/1943	 Greaser	 Merchant Navy	 United Kingdom	 Tower Hill Memorial	 Panel 21. Age 48. Son of John and Elizabeth McClean; husband of Mary Bridget McClean of Wicklow Irish Republic. John	 Norton	 57	 03/01/1943	 Donkeyman	 Merchant Navy	 United Kingdom	 Tower Hill Memorial	 Panel 21. Age 57. Husband of Mary Norton of Liverpool. William Henry	 Nuttall	 21	 03/01/1943	 Able Seaman	 Merchant Navy	 United Kingdom	 Tower Hill Memorial	 Panel 21. Age 21. Son of William Henry and Ellen Nuttall of Bootle Lancashire. Arthur Frederick	 Parkinson	 22	 03/01/1943	 Able Seaman	 Merchant Navy	 United Kingdom	 Tower Hill Memorial	 Panel 21. Age 22. Son of A. J. and Evelyn Parkinson of Preston Lancashire. John	 Parry	 28	 03/01/1943	 Steward	 Merchant Navy	 United Kingdom	 Tower Hill Memorial	 Panel 21. Age 28. Son of Hugh and Margaret Parry of Newborough Anglesey. His brother William Hugh also fell. William Henry	 Rogerson	 34	 03/01/1943	 Able Seaman	 Merchant Navy	 United Kingdom	 Tower Hill Memorial	 Panel 21. Age 34. Son of Roger and Alice Rogerson; husband of Doris Rogerson of Wallasey Cheshire. Reginald George	 Sherlock	 41	 03/01/1943	 Greaser	 Merchant Navy	 United Kingdom	 Tower Hill Memorial	 Panel 21. Age 41. Husband of Marie Sherlock of Moreton Cheshire. Wilfred Ernest Albert	 Short	 19	 03/01/1943	 Cabin Boy	 Merchant Navy	 United Kingdom	 Tower Hill Memorial	 Panel 21. Age 19. Son of James Wilfred and Rose Short of Nailsworth Gloucestershire. James	 Thomas	 52	 03/01/1943	 Carpenter	 Merchant Navy	 United Kingdom	 Tower Hill Memorial	 Panel 21. Age 52. Son of John and Anne Thomas of Pengwern Flintshire; husband of Elizabeth Thomas of Llangrannog Cardiganshire. Charles	 Thompson	 22	 03/01/1943	 Able Seaman	 Merchant Navy	 United Kingdom	 Tower Hill Memorial	 Panel 21. Age 22. Son of Charles Frederick Thompson and of Isabella Thompson of Sunderland Co. Durham. His father Charles Frederick perished with him. Charles Frederick	 Thompson	 65	 03/01/1943	 Boatswain	 Merchant Navy	 United Kingdom	 Tower Hill Memorial	 Panel 21. Age 65. Husband of Isabella Thompson of Sunderland Co. Durham. His son Charles perished with him. William	 Welch	 46	 03/01/1943	 Chief Cook	 Merchant Navy	 United Kingdom	 Tower Hill Memorial	 Panel 21. Age 46. Husband of Phyllis Elizabeth Welch of Liverpool. Arthur	 Whiteside	 22	 03/01/1943	 Greaser	 Merchant Navy	 United Kingdom	 Tower Hill Memorial	 Panel 21. Age 22. Son of William and Mary Elizebeth Whiteside of Birkenhead. She was a 6,895 GRT steam tanker that was sunk on 3 April 1941 by a torpedo fired by German submarine U-73 at position 58° 15' N 27° 30' W - off The Skerries. John Darley	 Birdsall	 22	 03/04/1941	 Third Officer	 Merchant Navy	 United Kingdom	 Tower Hill Memorial	 Panel 21. Age 22. Son of Hubert Darley Birdsall and Ethel Birdsall of Burniston Yorkshire. Peter	 Burgon	 30	 03/04/1941	 Boatswain	 Merchant Navy	 United Kingdom	 Tower Hill Memorial	 Panel 21. Age 30. Son of Peter and Mary Ann Burgon. Isaac	 Chapple	 31	 03/04/1941	 Able Seaman	 Merchant Navy	 United Kingdom	 Tower Hill Memorial	 Panel 21. Age 31. Husband of Catherine Chapple of Blyth Northumberland. David James	 Davies	 20	 03/04/1941	 Sailor	 Merchant Navy	 United Kingdom	 Tower Hill Memorial	 Panel 21. Age 20. Son of James Davies and of Margaret Anne Davies of New Quay Cardiganshire. His father James perished with him. James	 Davies	 49	 03/04/1941	 Greaser	 Merchant Navy	 United Kingdom	 Tower Hill Memorial	 Panel 21. Age 49. Husband of Margaret Anne Davies of New Quay Cardiganshire. His son David James Davies perished with him. Joshua Emlyn	 Davies	 28	 03/04/1941	 Greaser	 Merchant Navy	 United Kingdom	 Tower Hill Memorial	 Panel 21. Age 28. Son of Daniel and Hettie Davies; husband of Esther Ellen Davies of New Quay Cardiganshire. William Joshua	 Evans	 23	 03/04/1941	 Ordinary Seaman	 Merchant Navy	 United Kingdom	 Tower Hill Memorial	 Panel 21. Age 23. Son of Joshua and Anne Evans of New Quay Cardiganshire. Salvatore	 Falzon	 42	 03/04/1941	 Able Seaman	 Merchant Navy	 United Kingdom	 Tower Hill Memorial	 Panel 21. Age 42. Husband of Ann Falzon of Burradon Northumberland. John Graham	 Feint	 35	 03/04/1941	 Chief Officer	 Merchant Navy	 United Kingdom	 Tower Hill Memorial	 Panel 21. Age 35. Son of Frederick and Elizabeth Feint; husband of Joan Kathleen Feint of New Brighton Wallasey Cheshire. William	 Grainger	 55	 03/04/1941	 Storekeeper	 Merchant Navy	 United Kingdom	 Tower Hill Memorial	 Panel 21. Age 55. Husband of L. Grainger of Devonport. Harold	 Harbottle	 26	 03/04/1941	 Second Officer	 Merchant Navy	 United Kingdom	 Tower Hill Memorial	 Panel 21. Age 26. Son of Robert Frederick Harbottle and of Alice Hilaria Harbottle of South Shields Co. Durham. Edward	 Hughes	 34	 03/04/1941	 Chief Steward	 Merchant Navy	 United Kingdom	 Tower Hill Memorial	 Panel 21. Age 34. Son of Edward and Amelia Hughes of Sunderland Co. Durham. George	 Manson	 35	 03/04/1941	 Able Seaman	 Merchant Navy	 United Kingdom	 Tower Hill Memorial	 Panel 21. Age 35. Son of George and Ellen Manson; husband of Susan Manson of North Shields Northumberland. 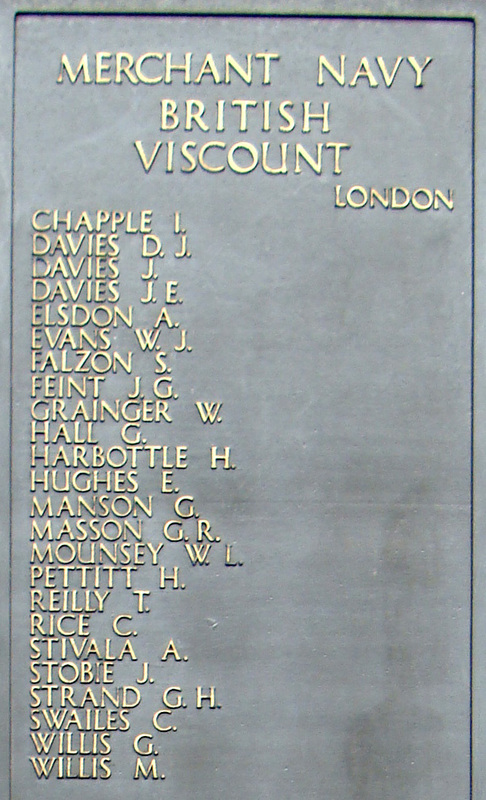 Gilbert Robertson	 Masson	 19	 03/04/1941	 Apprentice	 Merchant Navy	 United Kingdom	 Tower Hill Memorial	 Panel 21. Age 19. Son of Stephen and Barbara C. Masson of Muirend Glasgow. William Lawrence	 Mounsey	 28	 03/04/1941	 Third Radio Officer	 Merchant Navy	 United Kingdom	 Tower Hill Memorial	 Panel 21. Age 28. Son of Henry and Annie Mary Mounsey of Longtown Cumberland. Harold	 Pettitt	 39	 03/04/1941	 First Radio Officer	 Merchant Navy	 United Kingdom	 Tower Hill Memorial	 Panel 21. Age 39. Son of Edward and Mary Elizabeth Pettitt; husband of Alice Pettitt of Sheffield. Thomas	 Reilly	 31	 03/04/1941	 Fireman	 Merchant Navy	 United Kingdom	 Tower Hill Memorial	 Panel 21. Age 31. Husband of I. D. J. Reilly of Blyth Northumberland. Charles	 Rice	 31	 03/04/1941	 Able Seaman	 Merchant Navy	 United Kingdom	 Tower Hill Memorial	 Panel 21. Age 31. Husband of Evelyn M. Rice of Blyth Northumberland. Anthony	 Stivala	 35	 03/04/1941	 Sailor	 Merchant Navy	 United Kingdom	 Tower Hill Memorial	 Panel 21. Age 35. Son of Paul and Mary Stivala; husband of G. Stivala of North Shields Northumberland. James	 Stobie	 40	 03/04/1941	 Donkeyman	 Merchant Navy	 United Kingdom	 Tower Hill Memorial	 Panel 21. Age 40. Husband of Maria Stobie of Blyth Northumberland. George Henry	 Strand	 34	 03/04/1941	 Greaser	 Merchant Navy	 United Kingdom	 Tower Hill Memorial	 Panel 21. Age 34. Son of Sidney and Elizebeth Strand. Charles	 Swailes	 22	 03/04/1941	 Second Radio Officer	 Merchant Navy	 United Kingdom	 Tower Hill Memorial	 Panel 21. Age 22. Son of Benjamin and Florence Swailes of Bradford Yorkshire. Kings Scout. Gordon	 Willis	 17	 03/04/1941	 Ordinary Seaman	 Merchant Navy	 United Kingdom	 Tower Hill Memorial	 Panel 21. Age 17. Son of Michael and Elizabeth Willis of Blyth Northumberland. His brother Matthew perished with him. Matthew	 Willis	 23	 03/04/1941	 Sailor	 Merchant Navy	 United Kingdom	 Tower Hill Memorial	 Panel 21. Age 23. Son of Michael and Elizabeth Willis of Blyth Northumberland. His brother Gordon perished with him. She was a 6,994 GRT steam tanker that was sunk on 3 May 1942 by a torpedo fired by German submarine U-455 at position 44° 07' N 51° 53' W.
Kasimier	 Bolman	 30	 03/05/1942	 Greaser	 Merchant Navy	 United Kingdom	 Tower Hill Memorial	 Panel 21. Age 30. Native of Poland. Alexander	 Caithness	 58	 03/05/1942	 Donkeyman	 Merchant Navy	 United Kingdom	 Tower Hill Memorial	 Panel 21. Age 58. Husband of Eva Caithness of Dundee. James	 Forbes	 16	 03/05/1942	 Cabin Boy	 Merchant Navy	 United Kingdom	 Tower Hill Memorial	 Panel 21. Age 16. Son of Alexander Graham Forbes and Mary Forbes of Gourock Renfrewshire. James	 Macdonald	 18	 03/05/1942	 Cabin Boy	 Merchant Navy	 United Kingdom	 Tower Hill Memorial	 Panel 21. Age 18. Son of James and Janet Macdonald of Greenock Renfrewshire. 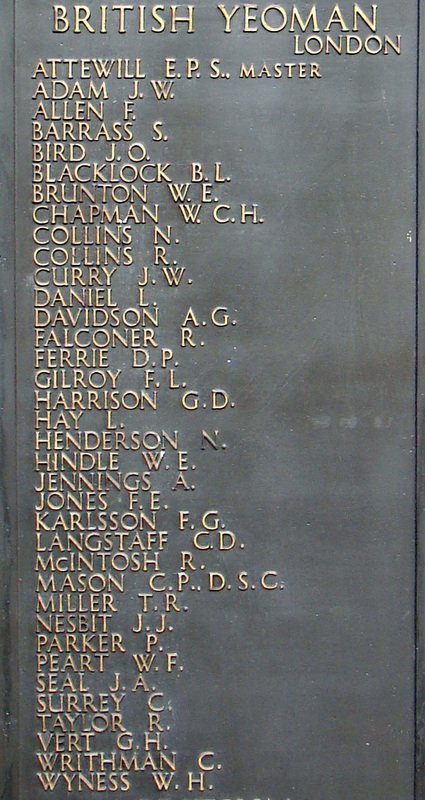 George Foster	 Paxton	 30	 03/05/1942	 Third Engineer Officer	 Merchant Navy	 United Kingdom	 Tower Hill Memorial	 Panel 21. Age 30. Son of Mr. and Mrs. G. F. Paxton; husband of Elsie Paxton of South Shields Co. Durham. Henry	 Woods	 15	 03/05/1942	 Cabin Boy	 Merchant Navy	 United Kingdom	 Tower Hill Memorial	 Panel 21. Age 15. Son of Richard and Mary Woods of Greenock Renfrewshire. James Morton	 Wright	 03/05/1942	 Fireman	 Canadian Merchant Navy	 Canada	 Halifax Memorial	 Panel 22. Husband of Annabella Wright of Hamilton Ontario. She was a 6,990 GRT steam tanker that was sunk on 14 July 1942 by a torpedo fired by German submarine U-201 at position 26° 42' N 24° 20' W.
James Walker	 Adam	 32	 14/07/1942	 Third Engineer Officer	 Merchant Navy	 United Kingdom	 Tower Hill Memorial	 Panel 21. Age 32. Son of John and Agnes Emily Adam; husband of Annie Ellen Adam of Glasgow. Frank	 Allen	 30	 14/07/1942	 Carpenter	 Merchant Navy	 United Kingdom	 Tower Hill Memorial	 Panel 21. Age 30. Son of John and Elizabeth Allen; husband of Elizabeth Allen of South Stanley Co. Durham. Edward Paul Spencer	 Attewill	 42	 14/07/1942	 Master	 Merchant Navy	 United Kingdom	 Tower Hill Memorial	 Panel 21. Age 42. Son of Arthur and Annie Attewill; husband of Nellie Attewill of New Malden Surrey. Samuel	 Barrass	 48	 14/07/1942	 Fireman	 Merchant Navy	 United Kingdom	 Tower Hill Memorial	 Panel 21. Age 48. Husband of Agnes Elizabeth Barrass of North Shields Northumberland. 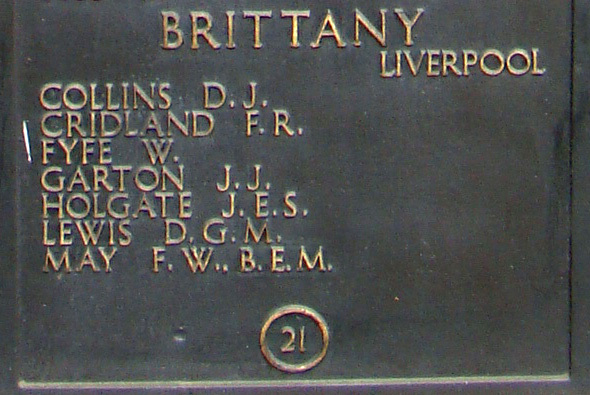 John Oates	 Bird	 39	 14/07/1942	 Donkeyman	 Merchant Navy	 United Kingdom	 Tower Hill Memorial	 Panel 21. Age 39. Son of Thomas and Eleanor Bird; husband of Isabella Agnes Bird of Horsley Hill South Shields Co. Durham. 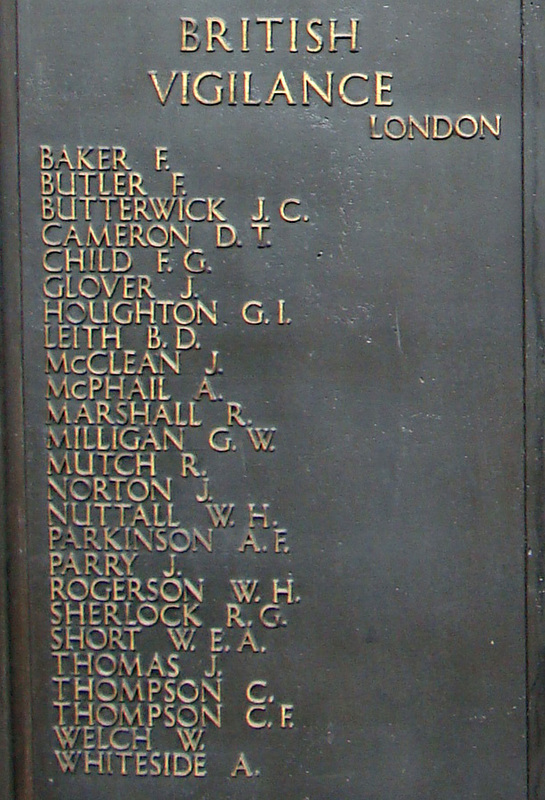 Benson Leck	 Blacklock	 21	 14/07/1942	 Sailor	 Merchant Navy	 United Kingdom	 Tower Hill Memorial	 Panel 21. Age 21. Son of Archibald Dowey Blacklock and Elizabeth Blacklock of North Shields Northumberland. William Edward	 Brunton	 22	 14/07/1942	 Sailor	 Merchant Navy	 United Kingdom	 Tower Hill Memorial	 Panel 21. Age 22. Son of William and Margaret Brunton of Chirton North Shields Northumberland. Walter Charles Henry	 Chapman	 20	 14/07/1942	 Second Radio Officer	 Merchant Navy	 United Kingdom	 Tower Hill Memorial	 Panel 21. Age 20. Son of Henry and Alicia Chapman of Armagh Northern Ireland. Nathaniel	 Collins	 60	 14/07/1942	 Fireman	 Merchant Navy	 United Kingdom	 Tower Hill Memorial	 Panel 21. Age 60. Son of Samuel and Annie Collins; husband of Patrica Collins of North Shields Northumberland. Robert	 Collins	 24	 14/07/1942	 Able Seaman	 Merchant Navy	 United Kingdom	 Tower Hill Memorial	 Panel 21. Age 24. Son of Nathaniel Collins and of Alice Collins of South Shields Co. Durham. James William	 Curry	 31	 14/07/1942	 Cook	 Merchant Navy	 United Kingdom	 Tower Hill Memorial	 Panel 21. Age 31. Son of James William and Catherine Curry; husband of Margaret Curry of South Shields Co. Durham. Lawrence	 Daniel	 17	 14/07/1942	 Cabin Boy	 Merchant Navy	 United Kingdom	 Tower Hill Memorial	 Panel 21. Age 17. Son of Lawrence and Florence Daniel of Leeds Yorkshire. Alan George	 Davidson	 42	 14/07/1942	 Junior Engineer Officer	 Merchant Navy	 United Kingdom	 Tower Hill Memorial	 Panel 21. Age 42. Husband of Jane Davidson of Belfast Northern Ireland. Robert	 Falconer	 20	 14/07/1942	 Ordinary Seaman	 Merchant Navy	 United Kingdom	 Tower Hill Memorial	 Panel 21. Age 20. Son of Chief Officer William Falconer and of Elizabeth Manners Falconer of North Shields Northumberland. Daniel Peter	 Ferrie	 21	 14/07/1942	 Steward	 Merchant Navy	 United Kingdom	 Tower Hill Memorial	 Panel 21. Age 21. Son of Daniel and Mary Ferrie. George Dalton	 Harrison	 30	 14/07/1942	 Able Seaman	 Merchant Navy	 United Kingdom	 Tower Hill Memorial	 Panel 21. Age 30. Son of William Harrison and of Hannah M. Harrison of South Shields Co. Durham. Leonard	 Hay	 30	 14/07/1942	 Greaser	 Merchant Navy	 United Kingdom	 Tower Hill Memorial	 Panel 21. Age 30. Son of Margaret Ann Taylor Hay; nephew of Frances Mary Redpath Eklund of Whitley Bay Northumberland. Norman	 Henderson	 18	 14/07/1942	 Deck Boy	 Merchant Navy	 United Kingdom	 Tower Hill Memorial	 Panel 21. Age 18. Son of Robert and Dorothy Henderson of Wallsend-on-Tyne Northumberland. Anthony	 Jennings	 36	 14/07/1942	 Greaser	 Merchant Navy	 United Kingdom	 Tower Hill Memorial	 Panel 21. Age 36. Son of Edward and Mary Ann Jennings; husband of J. Jennings of North Shields Northumberland. Frederick Ellis	 Jones	 33	 14/07/1942	 Chief Officer	 Merchant Navy	 United Kingdom	 Tower Hill Memorial	 Panel 21. Age 33. Son of John Wynne Jones and Florence Lavinia Jones of Willesden Green Middlesex. Cecil Desmond	 Langstaff	 17	 14/07/1942	 Ordinary Seaman	 Merchant Navy	 United Kingdom	 Tower Hill Memorial	 Panel 21. Age 17. Son of William Frederick Leonard and Edith Ethel Dorothy Langstaff of Catford London. Charles Powell	 Mason, D S C and Bar	 42	 14/07/1942	 First Radio Officer	 Merchant Navy	 United Kingdom	 Tower Hill Memorial	 Panel 21. Age 42. Son of Charles Edward and Eliza Mason. Thomas Robert	 Miller	 20	 14/07/1942	 Third Officer	 Merchant Navy	 United Kingdom	 Tower Hill Memorial	 Panel 21. Age 20. Son of Thomas Robert and Mabel Eliza Miller of Willerby Yorkshire. John James	 Nesbit	 17	 14/07/1942	 Cabin Boy	 Merchant Navy	 United Kingdom	 Tower Hill Memorial	 Panel 21. Age 17. Son of John James Nesbit and Mary Jane Nesbit of Whitley Bay Northumberland. William Frederick	 Peart	 18	 14/07/1942	 Assistant Steward	 Merchant Navy	 United Kingdom	 Tower Hill Memorial	 Panel 21. Age 18. Son of Sarah Jane Peart of North Shields Northumberland. James Alfred	 Seal	 25	 14/07/1942	 Cook	 Merchant Navy	 United Kingdom	 Tower Hill Memorial	 Panel 21. Age 25. Son of John Robert and Esther Seal; husband of Elizabeth Seal of Tynemouth Northumberland. 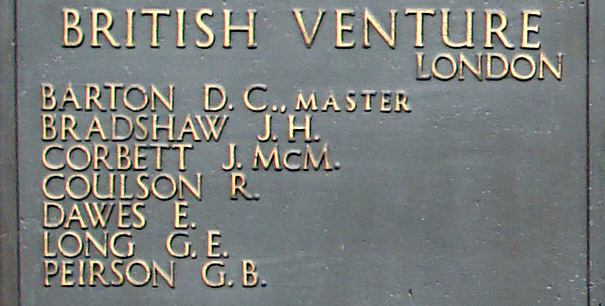 George Henry	 Vert	 37	 14/07/1942	 Greaser	 Merchant Navy	 United Kingdom	 Tower Hill Memorial	 Panel 21. Age 37. Son of George and Mary Vert. William Harkins	 Wyness	 20	 14/07/1942	 Apprentice	 Merchant Navy	 United Kingdom	 Tower Hill Memorial	 Panel 21. Age 20. Son of James McKenzie Wyness and Elizabeth Mary Harkins Wyness of Aberdeen. His brother Capt. James Harkins McKenzie Wyness M.C. R.A. died in the United Kingdom. She was a 5,273 GRT steam cargo ship that was bombed by aircraft on 4 July 1940 at position 50° 04' N 01° 55' W and beached at Selsey bill on 5 July 1940. Overall nine members of her crew were lost so presumably those not recorded by the CWGC were not British. Wilfred	 Bell	 16	 04/07/1940	 Pantry Boy	 Merchant Navy	 United Kingdom	 Tower Hill Memorial	 Panel 21. Age 16. Son of Andrew and Martha Bell of Hull. She was a 4,772 GRT motor cargo ship that was sunk on 29 October 1942 by a torpedo fired by German submarine U-509 at position 33° 29' N 18° 32' W. She was sailing from The Clyde to Buenos Aires with a general cargo when attacked. Francis Roger	 Cridland	 16	 30/10/1942	 Deck Boy	 Merchant Navy	 United Kingdom	 Tower Hill Memorial	 Panel 21. Age 16. Son of Francis Herbert and Alice Mary Cridland of Portishead Somerset. William	 Fyfe	 28	 29/10/1942	 Electrical Engineer	 Merchant Navy	 United Kingdom	 Tower Hill Memorial	 Panel 21. Age 28. Son of James and Agnes Fyfe of Old Kilpatrick Dunbartonshire. John Joseph	 Garton	 40	 29/10/1942	 Able Seaman	 Merchant Navy	 United Kingdom	 Tower Hill Memorial	 Panel 21. Age 40. Son of Mr. and Mrs. David Garton; husband of Ethel Muriel Garton of Swansea. John Edwin Sidney	 Holgate	 21	 29/10/1942	 Fourth Engineer Officer	 Merchant Navy	 United Kingdom	 Tower Hill Memorial	 Panel 21. Age 21. Son of Edwin Sidney Holgate and Mary Ethel Holgate of Ilford Essex. Dennis George Maunder	 Lewis	 19	 30/10/1942	 Stewards Boy	 Merchant Navy	 United Kingdom	 Tower Hill Memorial	 Panel 21. Age 19. Son of George and Ann Lewis. Francis William	 May, B E M and Bar	 52	 30/10/1942	 Chief Steward	 Merchant Navy	 United Kingdom	 Tower Hill Memorial	 Panel 21. Age 52. Son of George and Katherine May of West Ham Essex; husband of Dorothy May May of Seven Kings Ilford Essex. His son Gnr. Francis George May died in the United Kingdom. John	 Morris	 20	 29/10/1942	 Sailor	 Merchant Navy	 United Kingdom	 Tower Hill Memorial	 Panel 21. Age 20. Son of Ernest and Susan Annie Morris of Redland Bristol. William	 Paterson	 19	 29/10/1942	 Third Radio Officer	 Merchant Navy	 United Kingdom	 Tower Hill Memorial	 Panel 21. Age 19. Son of David and Agnes Paterson of Edinburgh. Edward	 Rooney	 33	 29/10/1942	 Sailor	 Merchant Navy	 United Kingdom	 Tower Hill Memorial	 Panel 21. Age 33. Son of Robert and Mary Ellen Rooney. William Edward	 Winsor	 32	 30/10/1942	 Assistant Steward	 Merchant Navy	 United Kingdom	 Tower Hill Memorial	 Panel 21. Age 32. Son of William Bennett Winsor and Mary Winsor; husband of Kezia Winsor. of Crosby Liverpool. She was a 1,013 GRT steam cargo that was sunk on 26 July 1940 by a torpedo fired by a German E-boat at a position 4 miles NE of Dungeness. Alexander Roberts	 Banks	 27	 26/07/1940	 Ordinary Seaman	 Merchant Navy	 United Kingdom	 Tower Hill Memorial	 Panel 21. Age 27. Son of George William Banks and of Ellen Banks of South Shields Co. Durham. Sidney	 Chapman	 27	 26/07/1940	 Able Seaman	 Merchant Navy	 United Kingdom	 Tower Hill Memorial	 Panel 21. Age 27. Son of Fredrich and Mary Chapman. William	 Keeling	 63	 26/07/1940	 Fireman	 Merchant Navy	 United Kingdom	 Tower Hill Memorial	 Panel 21. Age 63. Son of Samuel and Mary Keeling; husband of Georgina Keeling of South Shields Co. Durham. She was a 5,082 GRT steam cargo ship that was hit on 23 August 1940 by a torpedo fired by German submarine U-37 at position 54° 40' N 27° 57' W and sunk by gunfire.